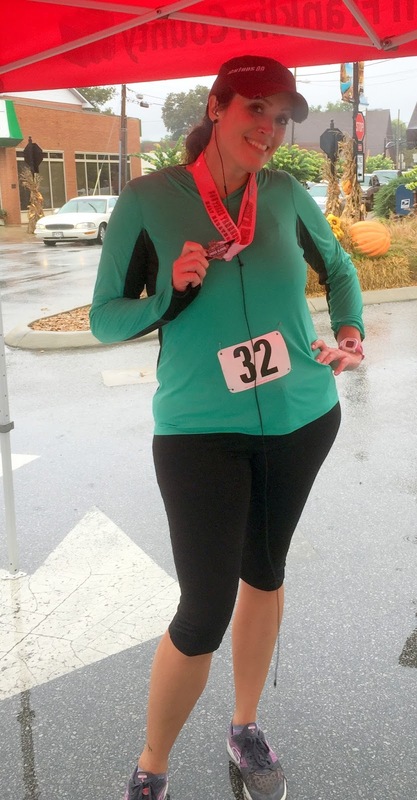 This weekend I ran half #17, the Southern TN Power Classic. 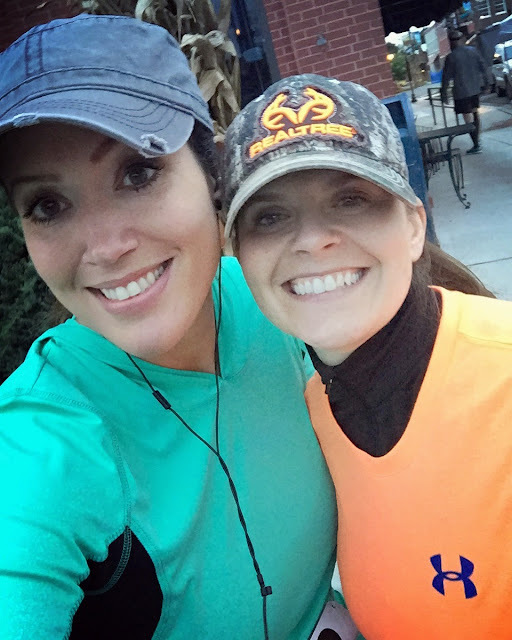 My friend Tammy decided to sign up for it too, so we were able to ride down (5 hour drive) and run together. Because of work we got a late start on Friday. 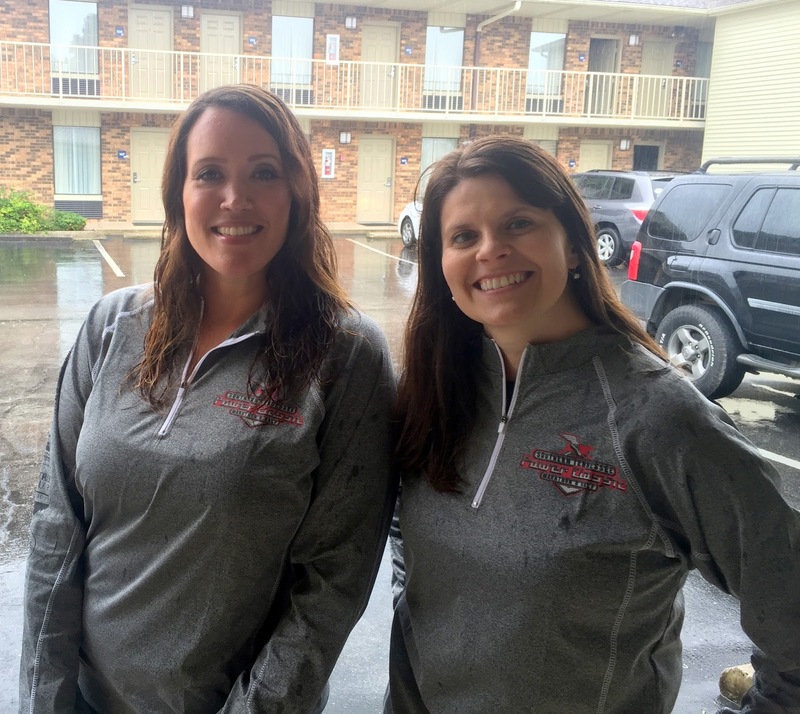 Thankfully packet pickup was available at 6 am on Saturday! 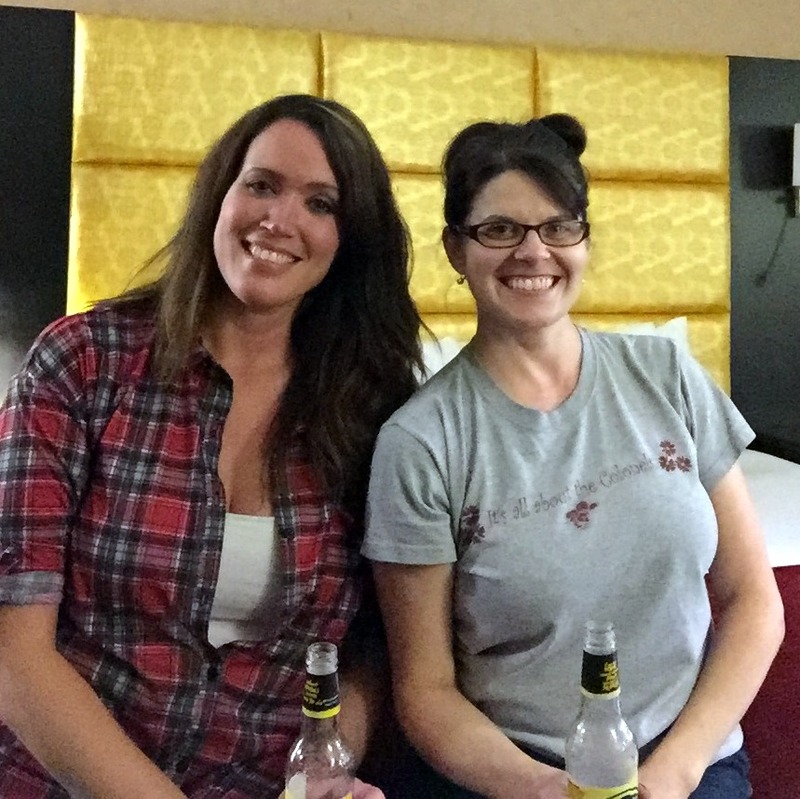 We get to our room around 11, Tammy sets off the fire alarm, and we couldn't stop laughing. Ok, that wasn't her fault, we had a crappy heater in our room. Thanks Best Western. We picked up our packets on Saturday morning, and it was freezing outside. We sat in the warm car and waited for the 7 am start. You can't tell, but we were shivering! There was no rain when we started, but after a couple miles, the misty rain started, and didn't end. Occasionally it would stop for a few minutes, and then sometimes it would just be a regular rain, but it was nonstop. It did bring back memories from 2 weeks ago when my race got cancelled. I'm just glad there was no lightning this time. Why can't I run a race when there is no rain?? Probably about 6 miles were on the main roads, and the remainder on a country road. There were so many friendly volunteers out helping with traffic. The police, EMS, fire fighters, and the military (Marines?). But despite that, there were still several scary moments with all the traffic. At one point, there were cars going around us on the left, and cars trying to get in the turn lane on the right, and we were right in the middle! Very scary. Then once we got on the country road, it was small and curvy and they told us to stay in the right lane. So we were running with traffic, instead of against it. We couldn't hear cars behind us until they were right there, that was pretty scary. Tammy asked me if we should get on the sidewalk, but it was all cracked and broken, not ideal for running on. So we stayed on the road and just tried to watch out for cars. That was definitely nerve wracking. Around mile 10 we were both like ok, I'm done with this! The cold, the rain, the close calls with the cars- we were done. But we really had a lot of fun. Tammy is so funny, and I spend a lot of time laughing at with her. It's awesome running with someone who runs your pace, so neither of you feel like you're slowing the other one down. They had some good looking stuff at the finish line, but for some reason I can never eat right after a race, so I pass on it all. Give me an hour, and then I'm ravenous! We did get a great tech sweatshirt! They skimped on the medal, but I'd rather have a nice shirt anyway. Even though the conditions weren't all that great, we still had a wonderful time! Can you eat right after a race, or do you have to wait awhile too? I also can't eat that much after a race. I did the VIP tent at Disney for my first half so I forced myself to eat the food afterwards. I didn't want that money going to waste. Now I don't do anything like that and I take my post-race food back with me and wait until I get hungry. If I did a VIP pkg, I'd definitely make myself eat it! I always take my food back to the room too, I know I'll want it later. 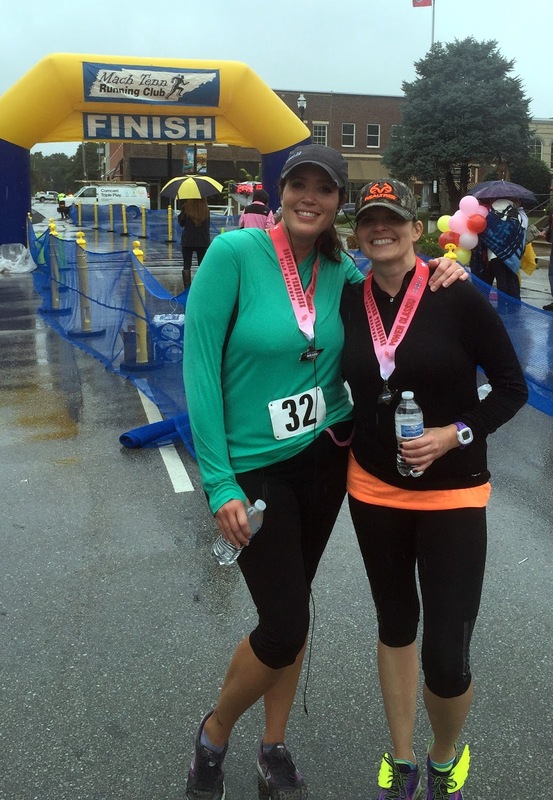 Great job on yet ANOTHER half marathon - you are so amazing!!!! Small races can be fun, but not that traffic part, that was kinda bad planning on their part and dangerous! I am like you, I rarely can eat right after I finish a longer race. It usually takes my stomach about 2 hours before I fell like eating much! Although, I definitely would have taken a cupcake to eat later, LOL those look fabulous! Great job on your race, and those are great shirts! 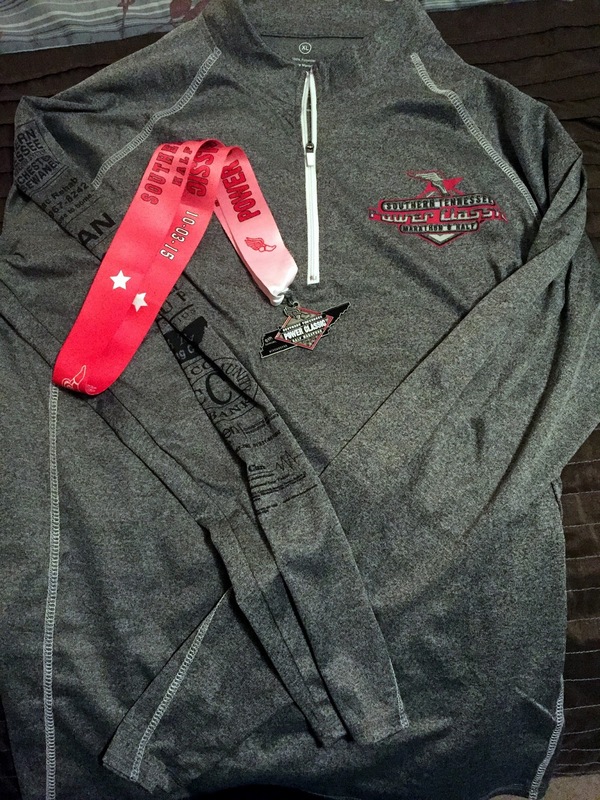 I'm not big on medals either, although I do like them if I finish a marathon, but the rest I could care less, stuff I can use later like a great shirt is a better plus for me! Way to go Katie. You do so well going all over to do your runs. Nice pictures too. Thank you Mark. I love traveling to new places to run! Way to go! I love that shirt! I ran thru Winchester while running the TN Ragnar relay last year. I ran the Adams County-run with the Amish Half last weekend and had the same issue with the traffic. I can eat right after the race, but I don't feel human again til I have a real meal. Thank you Deb! I guess they do the best they can with the traffic, but it sure makes me nervous, especially when you're not used to running with it. Great job! Not sure I'd want to tackle that elevation chart though, and the traffic? Yuck - but glad you were safe. I can handle a light rain if it's warm -- cold and rain, no thanks! 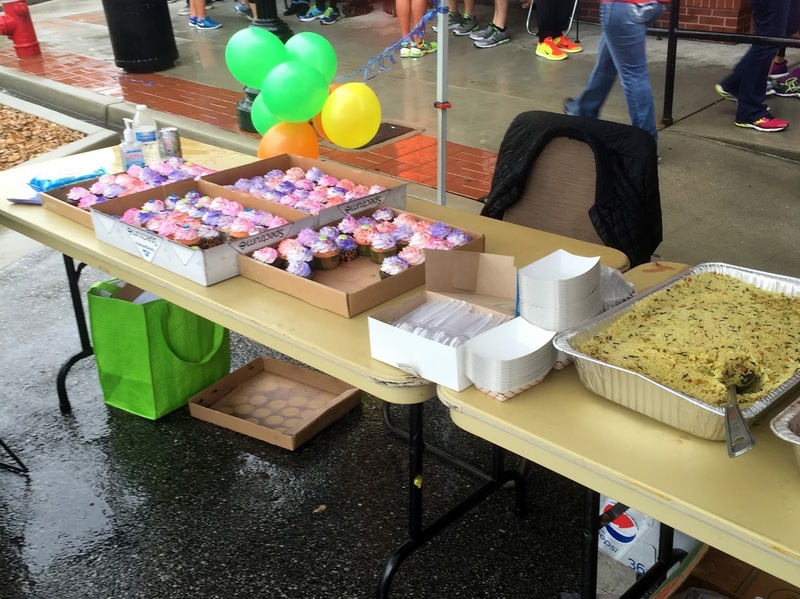 It's hard for me to eat right after running -- and the finish lines are too close to the food tables! I need to walk it off a little bit before getting my food. By the time I'm ready to eat something, my arms are full with a banana, bagel, bottle of whatever to drink, medal and other finish line swag, etc. that I can't find an empty hand to feed myself with. Thanks Elizabeth! Oh, I SO can relate to by the time you're ready to eat, your arms are too full to even eat! I've experienced that many times! I don't mind a warm rain either, but that cold rain just chills you to the bone. Wow. Amazing job powering through all those hills and all that rain. That is a tough course. No photographer??? Booooo!!! At least you got a couple of your own pics after the race. I love when I get tech shirts from races...especially long sleeve ones this time of year. Congrats on conquering those hills! I know, isn't that crazy? I don't remember ever running a race with no photographer there! Glad I did get a few of my own. Thanks Annette! It really was scary. Thanks girl! Congrats on #17! I love traveling for a race, even for just the night, it usually means less rest but it's so much more exciting! Great sweatshirt and cupcakes at the end! Thank you Krista! I agree, just getting away for a night and then racing is so much more exciting! Nice job! Maybe you should start a little slower, but I don't know. Most people tend to start too fast and burn out early. I guess you have plenty of experience. I never eat after a race, and for that matter not before either, lol I do intermittent fasting so I don't eat till later in the day. I figure I'm running on what I ate the evening before. It's a good idea to hydrate though. I've run a couple of halfs at a 7-30-7:45 pace. Thank you! I totally agree, I probably should start out slower. It seems impossible though! You do intermittent fasting? I have been looking into that lately, and last week did that for 3 days. I drank homemade juices during the day, and then ate a healthy dinner. I really liked it, and even lost a few pounds. I would like to do it again!